French toast is one of those things that tastes (and smells) so good you just can’t imagine it being healthy. But when you look at the basics of it, it’s SO easy to make clean! Not to mention you probably already have everything you need to make it in your house. Just exchange the white bread for a whole grain bread, the white sugar for a natural brown sugar of my favorite coconut sugar, coconut oil instead of butter, and use pure maple syrup. 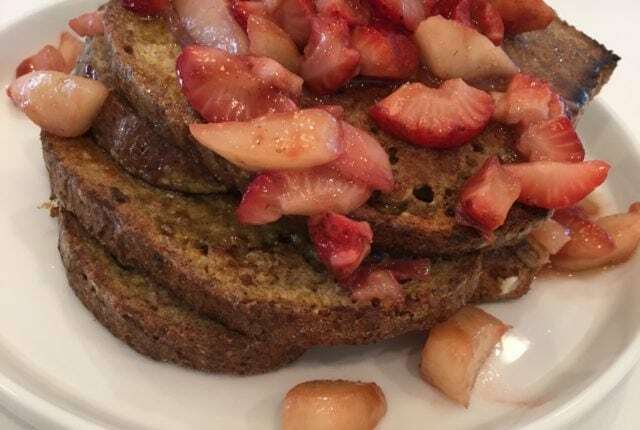 And voila- you have a clean and quick french toast recipe that tastes like a little piece of heaven. Whisk together eggs, milk, spices, sugar, and vanilla in a flat-bottomed baking dish. Spray/coat large skillet or griddle with coconut oil. Place bread slices in skillet or on griddle and cook until golden brown on each side, about 2-3 minutes. Serve with pure maple syrup and top with fruit if you’d like.